I’ve been working on our fairy gardens with my little girls this weekend, just like the ones we posted about here. We make them every year, and we really look forward to it. Today I want to share a new addition with you, that is definitely a new favourite. 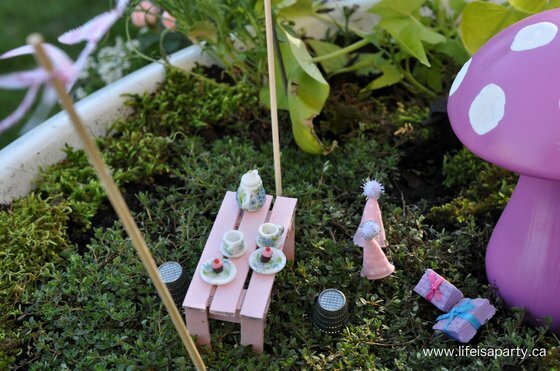 Just when you thought it couldn’t get any cuter than the fairy houses, it did. 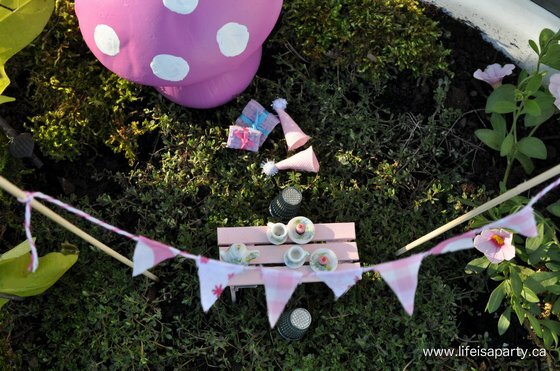 I decided I wanted to make a sweet little birthday party setting, just waiting for some fairies to fly down and enjoy it. I started out with this sweet little table, made out of popsicle sticks, hot glued together and spray painted pink. 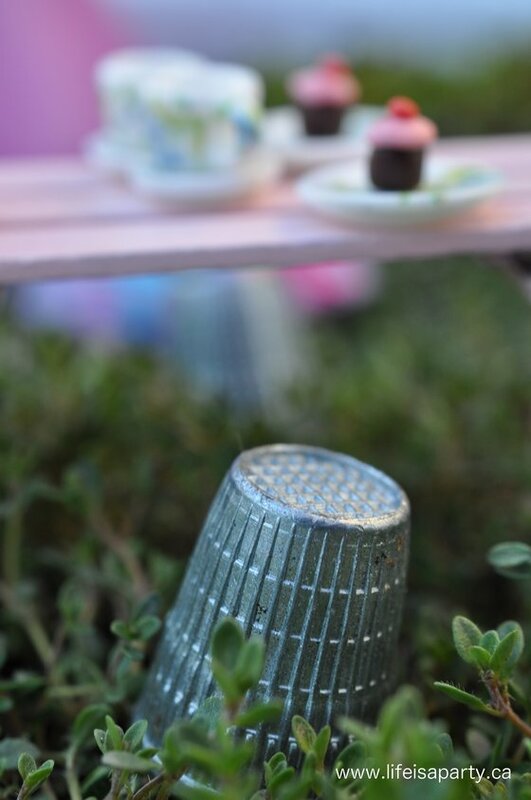 For chairs, our two little fairies each have a thimble to relax on. On the table I arranged this sweet little tea party set. I found it at a miniature store. 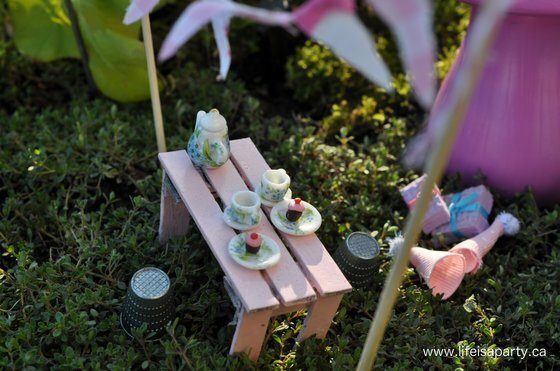 We’ve had this set in fairy gardens for the last couple of years, but because it’s real china, it can withstand the weather -worth the $10 it cost. What does every birthday party around here need? Cupcakes. 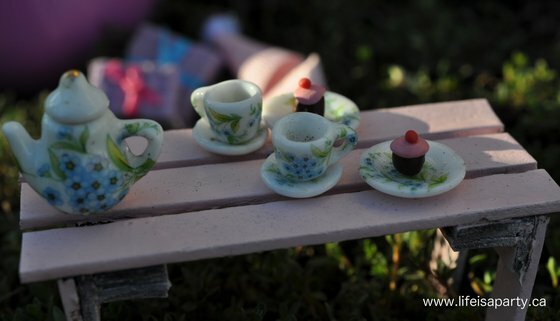 I used some polymer clay to make these teeny, tiny cupcakes. I kind of love them. After baking them for about 15 min, according to the package directions, they are nice and hard and should be weather safe. 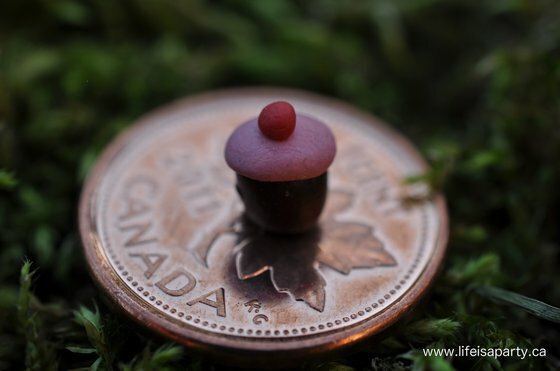 Here is one on a penny, to give you a sense of scale, aren’t they itsy, bitsy? 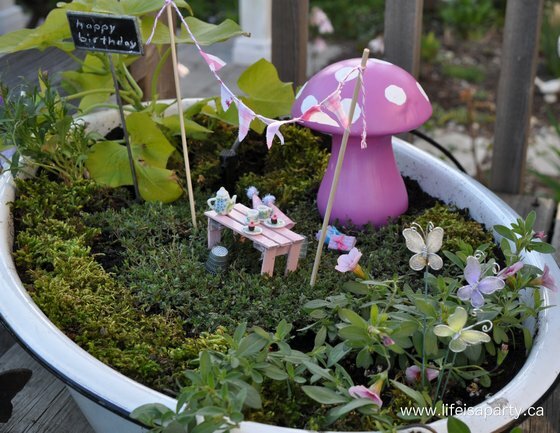 Perfect for a little fairy. Once I got into party mode, I wanted to make a little bunting. 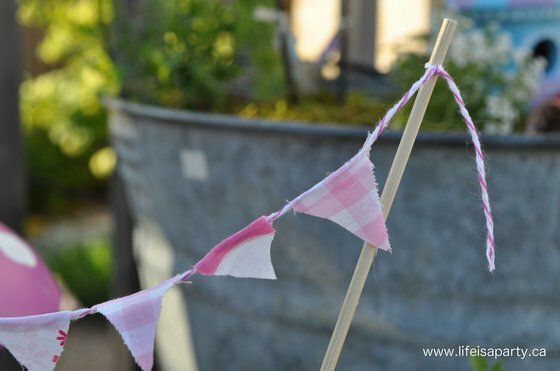 I used hot glue to attach some little pink flags to some baker’s twine and tied them to some skewers. I think it looks so sweet hanging over the table. Every birthday needs party hats. I made them out of a little ribbon, hot glue, and pom poms. And last but not least, we needed a few little prezzies. These are made out of a tiny piece of a old foam mat, the kind that fit together like a puzzle. I just used a regular knife to cut out a little rectangle, and tied a little satin ribbon on to make it look like a present. 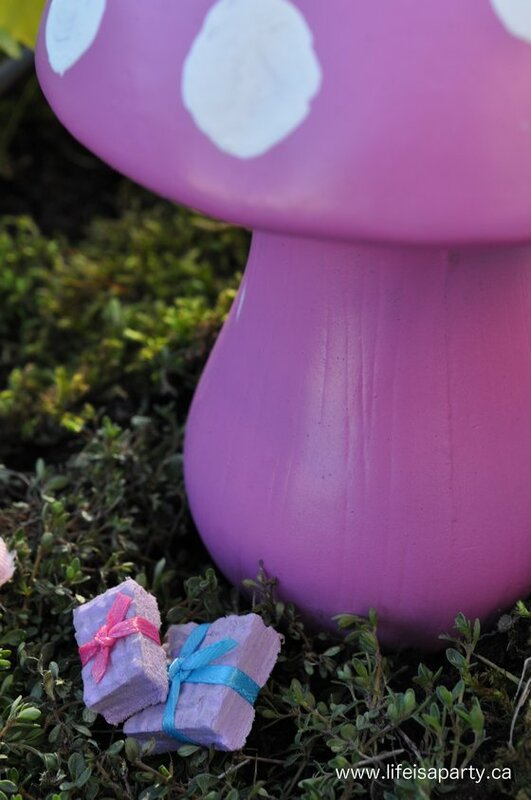 I also used my dollar store mushroom that got a pink stray paint makeover. 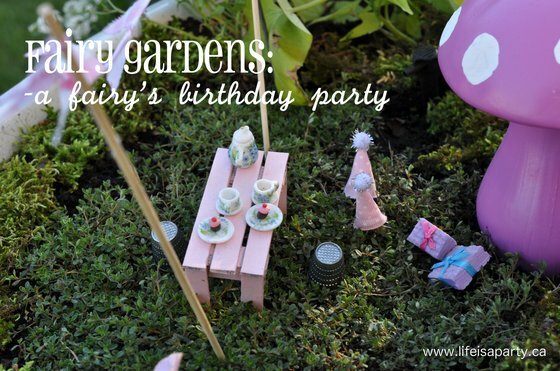 I set up our little birthday party on a nice little meadow of creeping thyme. I added a little moss around the sides too. You might have noticed the black nozzle and tubing in the background, that’s our fancy new irrigation system, that I’ll be sure to share all the details of soon. 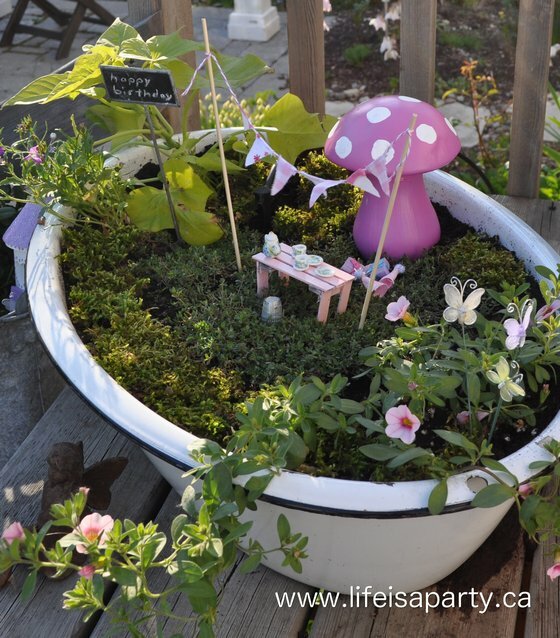 With a fairy garden like this, life really is a party…a fairy party. This post is linked up at Between Naps on the Porch, French Country Cottage, Craftberry Bush, Whipperberry, Tatertots and Jello, The 36th Avenue, and The Magic Onions Fairy Garden Contest.